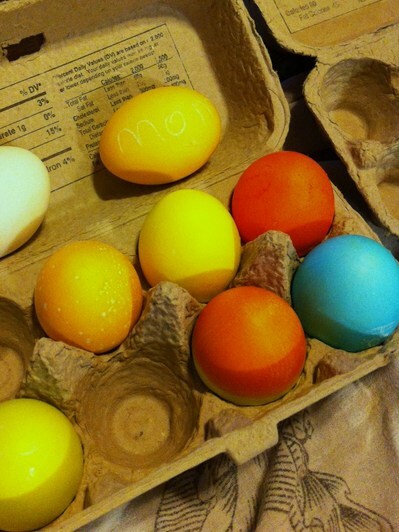 On Friday, the day before we dyed the eggs, Sophie’s class watched what we’re all calling The Puberty Video. She already knew pretty much everything there is to know, but still the whole thing is inherently filled with wonder and dread and all-consuming fascination. I think I remember that feeling, but I only knew a smidgen of what she knows when I was her age, so for me it was more, uh, vague, I guess. And dreadful. 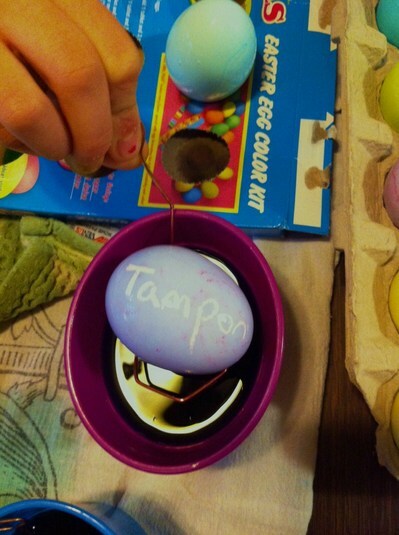 There are so many, many humans on this planet, and yet I am willing to bet that this is the world’s first and only Easter egg that says Tampon. You’ll notice that Pad has a heart around it, and period is red. 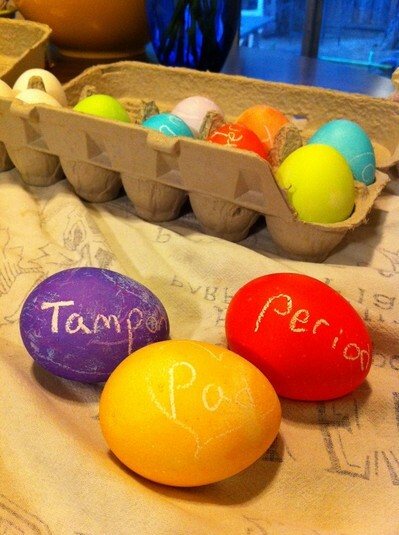 I sent the above photo to Jenny via a text message, and she named them Ironic Feminist Eggs. I’m not 100% sure of the artist’s intent here, but they made us laugh and then they made a damn fine egg salad for Monday’s lunchboxes. This entry was posted in Uncategorized on April 26, 2011 by jenijen. I love your kids and miss them and this only makes that ache worse. Bring them by soon, please. What an awesome girl! I love this. That is such overused blog terminology, but it’s all I have. And while I’ve met you before at other conferences, and this one may have been over the top in some ways, I have to say that I felt deeply on that over-the-top night that I got to spend a little bit of time with you that I was so glad you were there. I often find my daughter’s preoccupations represented in her art. She’s drawing lots of pregnant and nursing ladies these days. But this? Hilarious! Love it! That is so funny! She can come decorate graduation cupcakes next year. Last year at Jimmy’s party, we had one with “dork” on it. Wow, a power girl in the making! I love this generation of girls, they aren’t afraid to say what’s on their minds -or pen it.